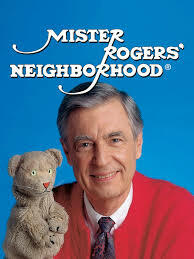 When I was a kid, I never really liked watching mister rogers neighborhood on PBS. It always seemed to slow for me. The hand puppets and all the long pauses seemed to me to be too cute by half. I never understood Fred Rogers until I became an adult, and listened to the adults who loved Mr. Rogers as children reflect on why. Some lived in the midst of loud, adult chaos and Mr. Rogers provided a daily, quiet oasis for these children. Some were abused and lonely, and Mr. Rogers wanted to have a friend just like them. Others, believing the narratives their parents and family told them – that they were worthless and annoying, heard Fred Rogers say the exact opposite: that they were special and that he accepted them just as they were. So, now, when I watch Fred Rogers (as I did in the recent documentary on his life, Won’t You Be My Neighbor) I have a new appreciation for what he was doing. Here was a man who took Jesus at his word (Rogers was a Presbyterian minister) and spent his whole professional life suffering the little children to come to him so he could bless them with gentle, loving acceptance. Someone that asked nothing of them except that they be as they were. That fact that many of these children were, indeed, suffering makes this even more poignant. We Christians have a name for this – unconditional love. Who, today, is interested in reaching out to children, many of them unloved, and some unlovely, with a message that affirms them in the midst of the chaos of their adults’ modern life? Thank you, Fred Rogers, for your example. And may God raise up others with your vision and compassion!